when trying to compile c++ code to a swc using Adobe Alchemy on my mac. Just add -DOSX at the end of your command line and it’ll compile…at least it did for me. I didn’t find any official documentation on this, just found this post on adobe forums suggesting the way above. I just found few articles from Digital Primates on how to build and debug a ANE for iOS and Android I want to share. Recently at the office we’ve been dealing with a strange BitmapData memory occupation behavior I want to share with you guys. This should be meaning that a BitmapData object should be represented in memory as a sequence of 32 bits integers, one for each pixel in the bitmap, hence width*height*4 bytes which definitely makes sense. However the actual behavior is significantly different and you can easily find out that the real BitmapData size in memory is not proportional to its area as it should be. 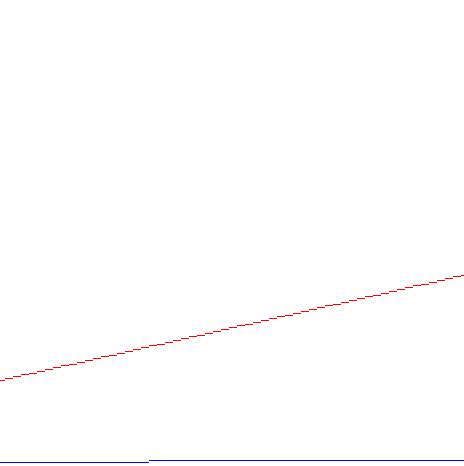 The example shows how different the size of a BitmapData is depending on its maximum dimension: the code instantiates 4096 images with an increasing area from 1 up to 4096 pixels, first with a horizontal extension (width is the increasing dimension, blue line in the chart) then with a vertical extension (height is the increasing dimension, red line in the chart). You can notice that the behaviors of the lines in the chart are very different and the blue line’s Y is increasing only few times whilst the red one’s (vertical bitmap) is increasing much more frequently and is reaching much higher values. So what’s the real memory representation of a BitmapData? For sure it isn’t a width*height*4 matrix as it should be and it is stricly related to the dimension the BitmapData is extended on. We worked a bit on this thing at the office (thanx to Matteo Lanzi) and we found out that BitmapData object memory allocator has a strange behavior: it allocates N chunks of memory aligned to 256bytes (64 pixels) at time. This would be a useful behavior if the BitmapData object would be resizable via actionscript, but it is not, or if the freed chunks were put in a memory pool and used by the next BitmapData requiring memory, but it doesn’t seem to do that ( the only case we noticed that the memory is reused is when a NxM BitmapData is created, deleted and recreated with the same N and M dimensions ). If it was only this however it wouldn’t have been such a big problem to deal with, the real big issue is that a 256b chunk is representing a sequence of pixels with a defined horizontal orientation. This hardcoded behavior leads to a very unpleasant side effect: a BitmapData instance with a high number of little rows (high height, little width,, hence a ‘vertical’ orientation) is occupying a HUGE AMOUNT OF MEMORY while it should be occupying the same memory of a bitmap with the same area rotated by 90°. a 1×1 px BitmapData allocates in the heap 1 chunk of 256 bytes while only 4 bytes would be needed!! 63x overhead!!! the same 256 bytes are allocated by a 64×1 bitmap and the overhead disappears, what does happen with a 65×1 one? with a ‘max chunk size plus one’ size a 65 px wide image allocates 2 chunks, the overhead is set to approx 1.9x. – actual allocation: 16 Kb!!!!! this is the worst case, every in 1xN bitmaps have the maximum overhead possible: 63x! So try to think about an image very narrow and high, let’s say a 1×4096 one: you would expect it to be 16kb in memory (4096*4 bytes) but it actually is 1 whole megabyte (4096*4*256!!)!! You can see a more detailed and complete dataset in this google spreadsheet http://bit.ly/FlashBitmapDataAllocation (feel free to spread the link) containing data for BitmapData memory occupation from 1×1 to 1×4096 and from 1×1 to 4096×1. Flash Player 11,1 by yourself (if you ran the swf linked backward in the post and noticed the same behavior). – the delta calculated with a pre and post sampling of System.privateMemory is more accurate than getSize() and fits the expected results in AIR but it’s not as accurate as I expected: in the spreadsheet linked backwards you can see that the results have a coherent trend, but there’s a lot of garbage data and little bitmaps weren’t detected at all. – the delta calculated witn a pre and post sampling of System.totalMemory is more accurate than System.privateMemory only in flash player. flash.display.Loader generates BitmapData instances when it loads images from URL or streams, so if an application needs to load many bitmaps that don’t fit the memory alignment there will possibly be a HUGE memory waste. which both take a data source and a preallocated bytearray as input and put outputs to the preallocated bytearray called destination. This is the first shot, I’d really like you guys to spread the word and help me to make adobe sensible on this topic as it’s really worth some effort to make flash and air runtimes even better than what they are now. I’m doing some experiments with “Broomstick“, the new born (alpha) version of Away3D which leverages the brand new Stage3D (molehill) of flash player 11 (incubator). This post is to summarize my session at the FlashCamp. this example shows the memory allocation behavior. Take a look to the saw tooth yellow line in the graph. two examples to show the difference between weak and strong references: basically weak do not increment reference count, strong do that. otherwise the GC doesn’t clean your keys ( example ). The GC iterates through each reachable node starting from the roots, one of these roots is the displaylist. So in order to ease the GC work we could flatten the whole displaylist to one bitmap by leveraging the usage of the blitting technique. These examples display about 1000 new objects drawn each frame by using the display list ( example ) or the blitting technique ( example ). The difference in performances are not only due to the different compositing techniques (built in compositing when using the displaylist VS manual compositing when using the blitting technique ) but also to the lower number of instances to be collected by the GC. The GC freezes the program when freeing the memory. The memory pool technique consists in reusing the instances of your objects preventing the GC to identify those objects as garbage. This makes your app memory utilization stable (a straight yellow line ) and removes every glitch due to the garbage collection. These examples show a simple particle fountain implemented by leveraging the memory pool technique ( example ) or not ( example ). If you need further help, please comment this post and let me know. Yesterday it has been a great day! Yesterday we had the FlashCamp here in Milan, hosted by WhyMCA mobile conference (thanks guys). Thanks to Adobe we even had a welcome guest: Mihai Corlan, who presented very cool new stuff putting his hands on Flex Builder 4.5 and the Flex Hero SDK. I really enjoyed the FlashCamp, it has been a pretty unique conference in Italy and it has been even more successful than we expected. Last but not least: my friend Luca already uploaded some pics to his flickr account. Up to flash 9 the size limit for a BitmapData object was 4096×4096 pixels. With flash player 10 that limit was removed, but what does this exactly mean? May we be able to create 4097×4097 sized bitmapdata instances? the answer is NO, we can’t. – we still have a limit! It actually depends on the stage quality. With a high quality set the bound limit is 4050×4050, if your content exceeds it gets cropped. With a low or medium quality the bound limit increases, there’s no official documentation about that (or at least I didn’t find it). Note that Adobe’s saying that “graphic artifacts” could be displayed when our stage “approaches” 3840 pixels range.